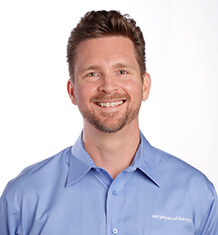 Stuart Eivers is the Clinic Manager of MTI Physical Therapy’s downtown Seattle clinic in The Washington Athletic Club (WAC). Stuart has been working in the field of outpatient orthopedics since 1992 after undergoing physical therapy himself for a period of time. He received a Master’s in Orthopedic Manual Therapy in 1997 and a Doctorate of Physical Therapy in 2000. He became a board certified Orthopedic Clinical Specialist in 2003 and is a Fellow of the American Academy of Manual Physical Therapists. Stuart has been teaching and consulting at the University of Washington’s Physical Therapy program and with the Ola Grimsby Institute. He has also been a clinical instructor for over 25 years and is MTI’s Clinical Education Coordinator. Stuart is a father of two and enjoys hiking, basketball and bicycling. He has been active in the basketball league and Golf Club at the WAC.